To watch video clips of the finger actions for each of the rhymes in this book, click on the links below. Six delightfully illustrated finger rhymes for sharing with babies and toddlers. 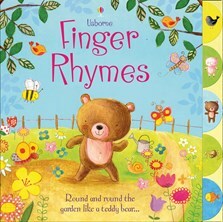 Each rhyme is accompanied by instructions for the finger actions, which can also be viewed in video clips on the Usborne Quicklinks website. Includes the rhymes “Round and Round the Garden”, “This Little Piggy”, “Two Little Dicky Birds” “One, Two, Three, Four, Five”, “Five Pretty Poppies” and “Incy, Wincy Spider”. Sturdy picture tabs allow favourite rhymes to be located quickly and easily.